“It came about in this way. The instant that the Professor had disappeared, it struck me what a really extraordinarily lucky chance Fate had placed in my way. I knew that Moriarty was not the only man who had sworn my death. There were at least three others whose desire for vengeance upon me would only be increased by the death of their leader. They were all most dangerous men. One or other would certainly get me. On the other hand. if all the world was convinced that I was dead they would take liberties, these men, they would soon lay themselves open, and sooner or later I could destroy them. Then it would be time for me to announce that I was still in the land of the living. So rapidly does the brain act that I believe I had thought this all out before Professor Moriarty had reached the bottom of the Reichenbach Fall. “I stood up and examined the rocky wall behind me. In your picturesque account of the matter, which I read with great interest some months later, you assert that the wall was sheer. That was not literally true. A few small footholds presented themselves, and there was some indication of a ledge. The cliff is so high that to climb it all was an obvious impossibility, and it was equally impossible to make my way along the wet path without leaving some tracks. I might, it is true, have reversed my boots, as I have done on similar occasions, but the sight of three sets of tracks in one direction would certainly have suggested a deception. On the whole, then, it was best that I should risk the climb. It was not a pleasant business, Watson. The fall roared beneath me. I am not a fanciful person, but I give you my word that I seemed to hear Moriarty’s voice screaming at me out of the abyss. A mistake would have been fatal. More than once, as tufts of grass came out in my hand or my foot slipped in the wet notches of the rock, I thought that I was gone. But I struggled upward, and at last I reached a ledge several feet deep and covered with soft green moss, where I could lie unseen, in the most perfect comfort. There I was stretched, when you, my dear Watson, and all your following were investigating in the most sympathetic and inefficient manner the circumstances of my death. “At last, when you had all formed your inevitable and totally erroneous conclusions, you departed for the hotel, and I was left alone. l had imagined that I had reached the end of my adventures, but a very unexpected occurrence showed me that there were surprises still in store for me. A huge rock, falling from above, boomed past me, struck the path, and bounded over into the chasm. For an instant I thought that it was an accident, but a moment later, looking up, I saw a man’s head against the darkening sky, and another stone struck the very ledge upon which I was stretched, within a foot of my head. Of course, the meaning of this was obvious. Moriarty had not been alone. A confederate — and even that one glance had told me how dangerous a man that confederate was — had kept guard while the Profcssor had attacked me. From a distance, unseen by me, he had been a witness of his friend’s death and of my escape. He had waited, and then making his way round to the top of the cliff, he had endeavoured to succeed where his comrade had failed. “I did not take long to think about it, Watson. Again I saw that grim face look over the cliff, and I knew that it was the precursor of another stone. I scrambled down on to the path. I don’t think I could have done it in cold blood. It was a hundred times more difficult than getting up. But I had no time to think of the danger, for another stone sang past me as I hung by my hands from the edge of the ledge. Halfway down I slipped, but, by the blessing of God, I landed, torn and bleeding, upon the path. I took to my heels, did ten miles over the mountains in the darkness, and a week later I found myself in Florence, with the certainty that no one in the world knew what had become of me. It was indeed like old times when, at that hour, I found myself seated beside him in a hansom, my revolver in my pocket, and the thrill of adventure in my heart. 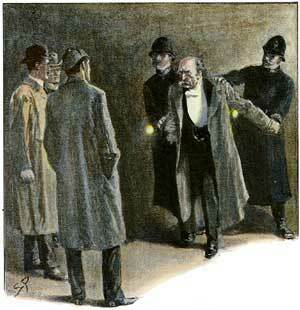 Holmes was cold and stern and silent. As the gleam of the street-lamps flashed upon his austere features, I saw that his brows were drawn down in thought and his thin lips compressed. I knew not what wild beast we were about to hunt down in the dark jungle of criminal London, but I was well assured, from the bearing of this master huntsman, that the adventure was a most grave one — while the sardonic smile which occasionally broke through his ascetic gloom boded little good for the object of our quest. I had imagined that we were bound for Baker Street, but Holmes stopped the cab at the corner of Cavendish Square. I observed that as he stepped out he gave a most searching glance to right and left, and at every subsequent street corner he took the utmost pains to assure that he was not followed. Our route was certainly a singular one. Holmes’s knowledge of the byways of London was extraordinary, and on this occasion he passed rapidly and with an assured step through a network of mews and stables, the very existence of which I had never known. We emerged at last into a small road, lined with old, gloomy houses. which led us into Manchester Street, and so to Blandford Street. Here he turned swiftly down a narrow passage, passed through a wooden gate into a deserted yard, and then opened with a key the back door of a house. We entered together, and he closed it behind us. “Surely that is Baker Street,” I answered, staring through the dim window.